The 'Thought' tool show the attachments of a thought. Some of these attachments are designated 'Internal' meaning (as I assumend): "This attachment is stored within the brain." (deep down in the brain's file folder or in the database), meaning: "They will be move around or back-uped with the brain. But now I'm confused. If you activate 'Show virtual Thoughts for folders', the files of virtual folders also are designated as 'Internal', this time meaning of course (as I assume): " internal to that folder, but not internal to the brain", menaning they will not be moved around with brain. My first impulse was to (wrongly) assume that these files had been moved into the brain. Now, everytime I read 'Internal', I have the if the thought is virtual or not. No, they have not, virtual thoughts are just representations of folders in the plex. Nothing is moved into TB. Yes, zenrain, I know that; but I can't tell it by a cursory glance at the attachments which say 'Internal'. That's what triggered my attention; I find this confusing. I have stop/break my work flow to reassure myself, that these really are file of virtual folders. True. 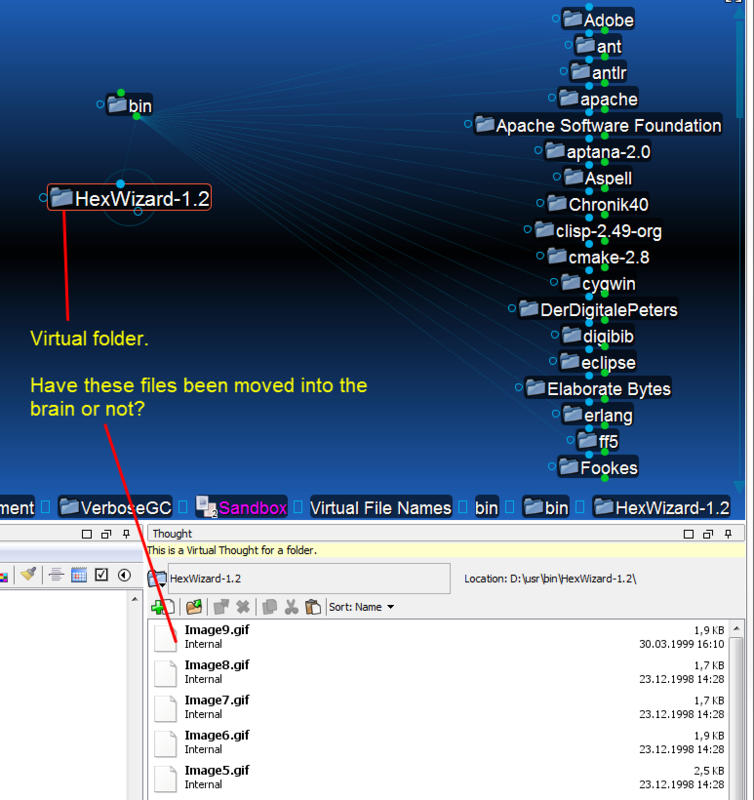 The current visual indicators are the blue folder and the "this is a virtual thought" text under the Thought tool tab. I agree that the internal location could be misleading.